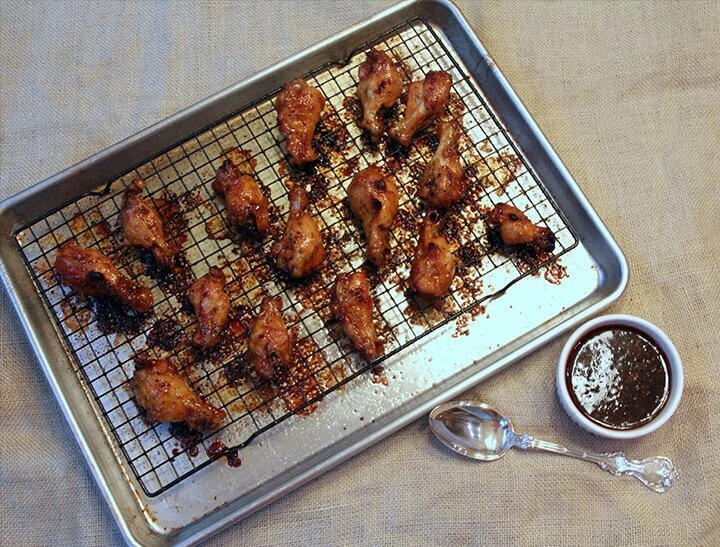 Baked Chicken Wings with Honey Sriracha Sauce - Game Day Favorite! These Baked Chicken Wings with Honey Garlic Sriracha Sauce are spicy-sweet, sticky, and DELICIOUS! 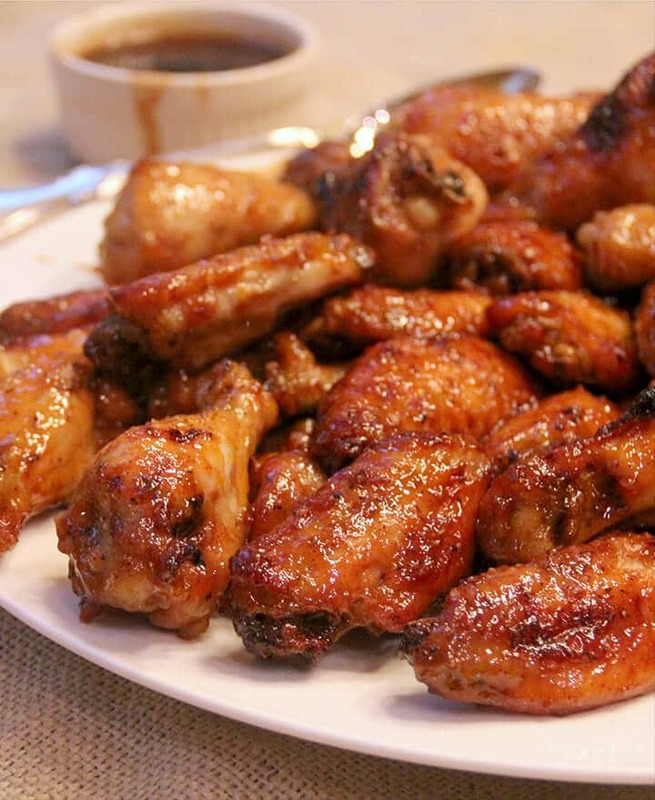 These wings are my family’s favorite and we always have them on the table for game day! It also doesn’t hurt to ply him with a bit of vodka before you serve the food, but, hey, whatever works! And these baked chicken wings are absolutely one of the best things I’ve ever made. They’re just the right combination of spicy and sweet, sticky, and so tender the meat falls off the bones. Since these are oven baked wings, not fried, and there is no breading, they are healthier than a lot of chicken wing options. But if you prefer traditional fried wings, here’s a great recipe for the Best Fried Buffalo Wings! My family likes spicy, so I thought Sriracha sauce would be a good touch for the baked chicken wings, along with honey and of course, garlic. Turns out, those things add up to an amazing combination! Interesting question: Do you prefer the drums or the flats? Join this debate for the Best Part of the Chicken Wing! Baking pans – these pans from Nordicware are inexpensive and excellent quality. I have about 8 of them and use them daily! Baking racks – these are essential in my kitchen! Step 1. Preheat oven. Place rack in baking sheet and lightly spray with cooking oil. Place wings on rack and brush with vegetable oil. Step 2. Sprinkle one side of wings with garlic powder, salt, and pepper. Bake for 20 minutes then flip and repeat on the other side and bake an additional 25 minutes. Step 3. Remove baking sheets after 25 minutes and dip wings in sauce. Place back on rack and bake an additional 10 minutes. Pro tip: You can broil the wings for a couple of minutes to get them crispier. Step 1. Melt butter with sesame oil in a small pot. Add garlic and ginger and stir for 20-30 seconds. Add honey, Sriracha, soy sauce, red pepper flakes, and lime juice. Stir 1 tablespoon water with the 2 teaspoons cornstarch to make a slurry. Step 2. Whisk the cornstarch slurry into the sauce and bring to a boil. Reduce to simmer and cook 3-4 minutes, just until slightly thickened. Pro tip: Sauce for the baked chicken wings can be made up to two days in advance and refrigerated until ready to use. Warm slightly before using. Pro Tip: This sauce would be amazing on a grilled pork tenderloin or even sliced flank steak. The possibilities are endless. Usually if we’re having these Honey Sriracha Wings, it’s for a game day party or some type of gathering. If that’s the case, I’ll add some Pimento Cheese and a few other dips, and maybe my Lemon Basil Pesto Pasta Salad. You can also pick up some cole slaw from the deli and call it good! Don’t forget dessert for your party–add some of these Easy Lemon Bars with Brown Sugar Shortbread Crust and your friends will think you’re amazing! Spicy, sweet, sticky and fall-off-the-bone tender, these baked chicken wings may be the best you’ve ever made. Preheat oven to 400. Place rack in baking sheet and lightly spray with cooking oil. Place wings on rack and brush with vegetable oil. Sprinkle wings with granulated garlic, salt, and pepper. Bake wings for 20 minutes, remove pan and turn wings over. Brush the other side with oil and sprinkle with granulated garlic, salt, and pepper. Place back in oven for 25 minutes. If using two baking sheets, alternate oven racks when you put the pans back in the oven. 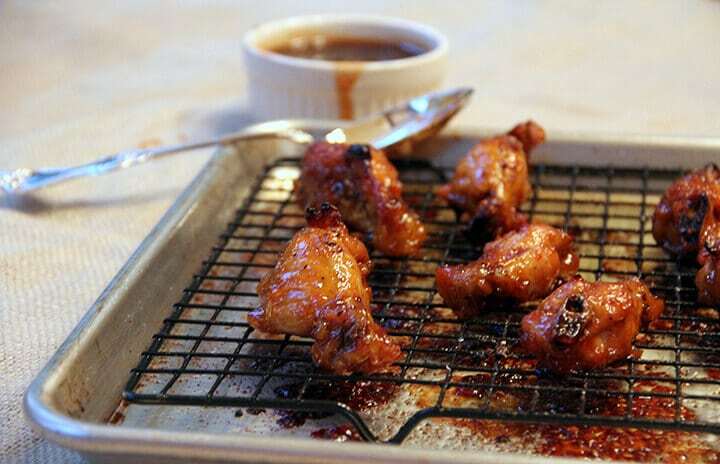 Remove pans after 25 minutes and dip wings in sauce. Place pans back in oven for 10 minutes. Melt the butter with sesame oil in a small pot over medium heat. Add garlic and ginger and stir for 20-30 seconds. Add honey, Sriracha, soy sauce, red pepper flakes, and lime juice. Stir 1 tablespoon water with the 2 teaspoons cornstarch to make a slurry. Whisk the cornstarch slurry into the sauce and bring to a boil. Reduce to simmer and cook 3-4 minutes, just until slightly thickened. At the end of the baking time, you can broil the wings for a couple of minutes to get them crispy. Sauce can be made up to two days in advance and refrigerated until ready to use. Warm slightly before using. 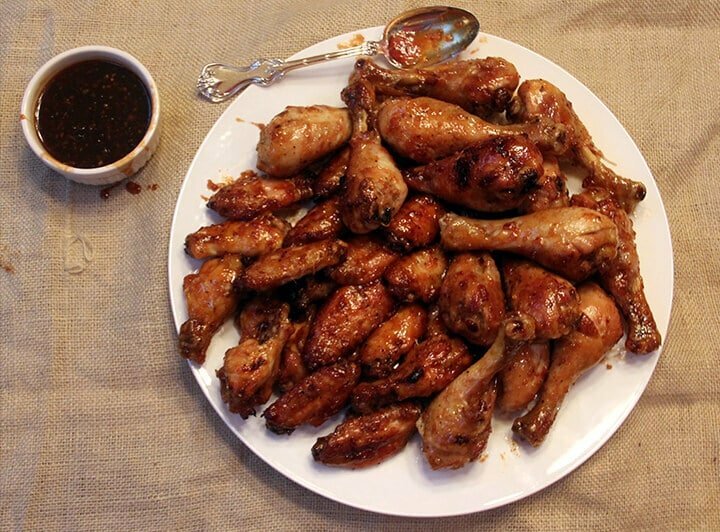 Adapted from Food Network’s Honey-Sriracha Chicken Wings. 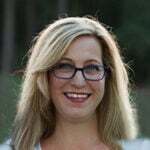 Update Notes: This post was originally published May 16, 2014, and on January 18, 2019, was updated with one or more of the following: step-by-step photos, video, updated recipe, new tips.